Spring is galloping ahead here in Mudgee. We’ve had some rain and the garden is flowering in quite an unrestrained fashion. Many trees have finished their Spring blossoming and are now decked out in leaves of soft tender green. I’ve been away for almost a week and have returned to find that new blooms are out, weeds have been profligate, and myriads of aphids have attached themselves wantonly to new rose shoots and buds. One: In a froth of pink and mauve, Alyssum and Leptospermum scoparium ‘Pink Cascade’ jostle for space in the front garden. 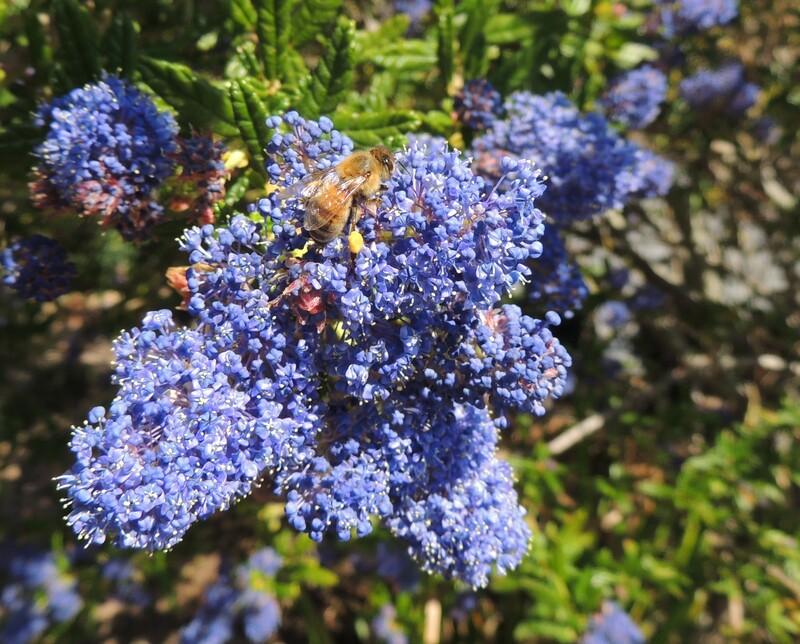 Two: Bees are loving the heavily flowered Ceonothus ‘Blue Pacific’, stuffing their saddlebags to the brim before flying off to deposit the largess from this generous shrub into their hives. Three: As mentioned before, Ranunculas are a soft spot with me for their hardiness, their ability to spread around the garden and their apparent disdain for slugs and snails. 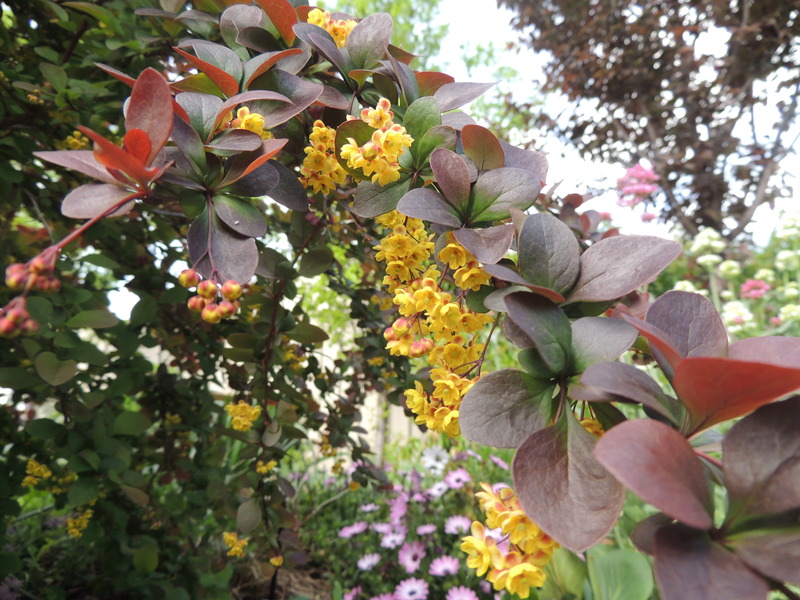 Four: Dainty butter yellow flowers cluster below the garnet-coloured leaves of the Berberis thunbergii Atropupurea. This shrub has terrible thorns, but it’s easy to forgive it this shortcoming when it has beautiful leaves, flowers and berries. 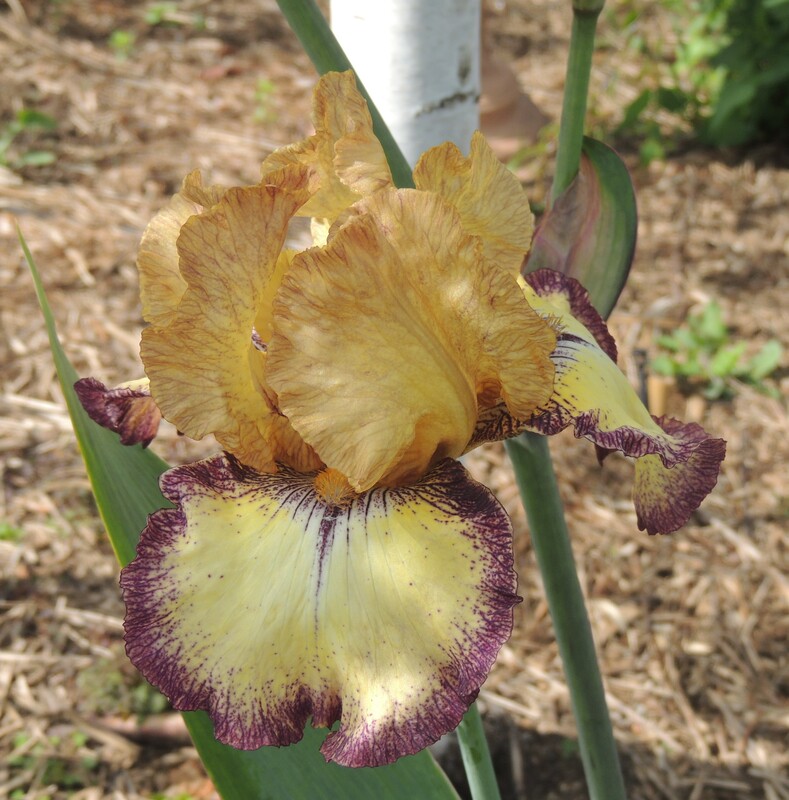 Five: A beautiful Bearded Iris, given by a friend. I have no idea of its name, but find it quite unusual. The colours of the petals are so delicate and the veins highlighted exquisitely in fine point. 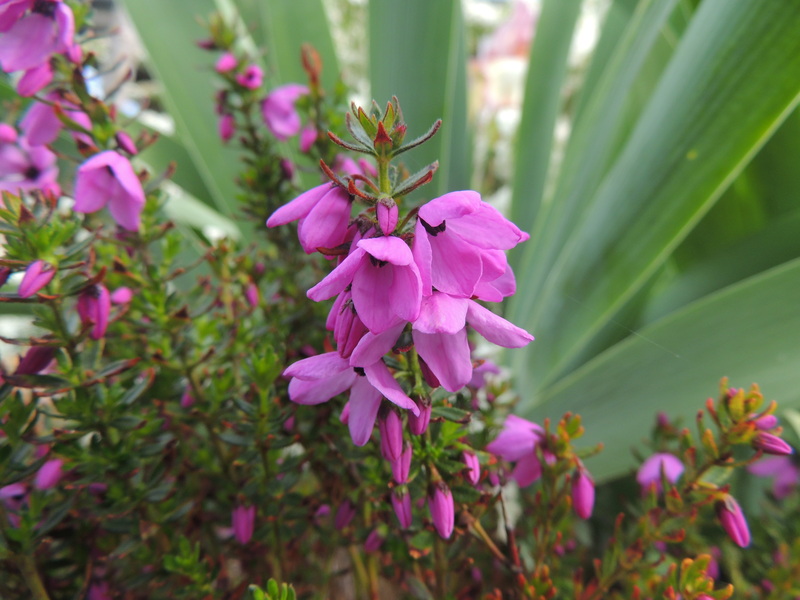 Six: This is an Australian native- Tetratheca thymifolia ‘Fairy Bells’. It has the common name of Black Eyed Susan but it isn’t like any Black Eyed Susan I know. It’s had a struggle, first finding clay soil difficult to deal with (too much water being held in the soil), and then taking a battering from the severe winter frosts. It looks as though it has decided to pick up now and I hope it will continue to do well. It should be covered in flowers for months. It’s a lot of fun looking at what other gardeners are doing in their gardens, and you can look too, by popping over to The Propagator’s blog as he’s the host of this very popular meme. You can see the other Six on Saturdays here. Weather today: 7-21 degrees C, mostly sunny. Happy gardening everyone. What a joy to come home to. You write beautifully Jane. Lovely edging to the iris. Isn’t it? I’m just so taken with it. Thank you. I’ve seen and attempted to photograph Tetratheca many times when I’ve been in Australia but in the wild they’ve not seemed to be especially floriferous. Is yours a selected form? it looks to be a good colour with lots of blooms. Interestingly, your Berberis is putting on a better flower display than they normally do with us, it’s used for hedging here quite a bit. I bought mine from the local hardware come plant shop…not even a nursery really, Jim, so I don’t have much information about it. The Berberis is a good plant to have, but I fear it will need a serious haircut before too long which means a few squabbles over spines. Jane, your garden is truly splendid. What a happy time of year, apart from the aphids. Regards. Tracy. Thank you, Tracy. It’s a splendid time of year which will too soon be over and we’ll be into the rigours of Summer. I’m hosing the aphids off because I don’t want to use poisons, but they keep returning. Jane, we are hosing the aphids into a fine mesh sieve. And then squashing them. My goodness, there are just so many! That sounds like a great deal of work, Tracy, but a pretty good way of getting rid of them. Plenty of colour in your garden now Jane! A necessary fix for us up north in the arctic wastes. Lovely Six, thanks.for sharing. This is the best time, Jonathan. Soon it will be too hot and dry and we’ll be having to water. Your post is delightful as always, Jane. What a glorious show of colour to return to (turn a blind eye to those weeds and soap the wretched aphids!). I love that explosion of ranunculus, you’ve inspired me to try some here as almost anything that grows from a bulb goes well and anything that is slug and snail resistant is a definite bonus. They are so pretty! Thanks, Lis, I’ve soaped the aphids, but will definitely have to do it again. I’d like to know where such an astonishing proliferation appears from! The ranunculas are certainly worth a try, I’m sure they’d do well for you. What a wonderful garden and what a pleasure to see spring photos … It’s the charm of the meme SixonSaturday that gives us the opportunity to share about our gardens all over the world. As Jim said, berberis don’t bloom as much as yours, maybe not the same species … For the flowers “Black Eyed Susan”, here it’s rather thunbergia alata that we call Black Eyed Susan, yours are very pretty. Hello Fred, yes, I know the thunbergia type of Black Eyed Susan which is considered a weed here in Australia. I was surprised to learn that my little native had that name as well. My Berberis is a small ornamental kind, not the one that’s often used in farm hedges, perhaps that’s the difference. I agree about SoS: it’s so nice to connect with gardeners worldwide. Isn’t your L. Pink Cascade beautiful? What a delight! It’s is, Liz. I look forward to its amazing blooms every Spring. I am enjoying your spring garden as mine slowly declines and the colours fade. I love the Iris which mimics the Berberis colours. And I must buy some Ranunculas especially if they truly are S&S resistant! Your Tetratheca thymifolia ‘Fairy Bells’ is adorable. I am always looking for Australian and NZ plants. I wonder if this is available over here? I have so many snails in my garden lurking in the Agapanthus and the Cotyledon and they absolutely haven’t touched the Ranunculas, I promise! The label for my Tetratheca says it will grow well in most soil types as long as it has good drainage, and it should also be happy in a pot. I hope you can find one, Jude. I have just looked up where Mudgee is – being useless at geography, I hadn’t even realised it was in Australia!!!! I much prefer your Black eyed Susan’s to the standard ones with yellow petals. Interesting Six again. We learn a new thing every day, so ‘they’ say! Mudgee is only a small town. My Black Eyed Susan is a completely different plant and I was surprised to find it had that name. We have the yellow one here, but it’s regarded as a weed. Love your spring flowers Jane! So pretty to see as our plants are all going over and succumbing to fall and the colder temps. Keep those photos coming – I’ll need them to get me through the long winter. Thank you, Cindy, I’ll do my best! Summer can be quite difficult for us if we get very high temps and no rain- which is pretty much what has been forecast. Although everything looks good just now, we are still officially in drought. Ah yes, I’d heard you got some decent rain in Mudgee – fancy your location making our news. That bearded iris is a stunner. Since I have many iris varieties photographed from the Royal Botanic Gardens here in Melbourne, I had a quick look to see if I had that one (with a name) in my old iPhoto library, but no. Your iris photo is a lovely one (as they’re not an easy flower to photograph). Was Mudgee on the news? Thank you for trying to ID the iris, Vicki. I’ve been very careless about keeping plant labels, and there are so many plants I don’t know in my garden. I’m picking up my game now though. It’s interesting to see how early things bloom in Australia. Beared iris would be a mid summer plant for me, much later than Spring. All beautiful Jane, autumn gales here. Urgh! I think you might be right about things blooming a bit earlier…perhaps more sun? I have no idea really, but I’m observing that our Autumn is later too as it’s still hot in March here, almost like Summer, really. Don’t get blown away, Jessica! Beautiful flowers–all singing, “Spring! Spring!” The Ceanothus in particular–such a blue. Thanks hb. The Ceonothus is a very bright spot in the garden; it’s a shame they’re short-lived. It’s a native from California I think, is it not? The trouble with working through the myriad posts each Saturday is that by the time I get to some everyone else has beaten me to the comments I would have made if I’d got in first. So I’ll just say “beautiful” and “what everyone else said”. Thank you, John. I know what you mean! Your comments are much appreciated. Hello Gill, you should be able to grow Tetratheca there as long as it has good drainage. It’s only a small plant-40cmx40cm. My label says it will grow in a container too. Lovely to see such vibrant blooms. The last one is new to me too. Gorgeous! Thank you Chloris. It’s the best time in the garden. Great post and AWESOME photos! Your yard is ablaze with color and life! Great job! My forecast says to expect a frost Monday night. YIKES! Thank you Lonnie. Frost- ooh, horrid. I’ve had enough of that for a while! Your Ceonothus is wonderful! I haven’t seen that in years. Yes, it’s a good show, thank you Nate. Sadly it has a short life, I believe. The same here in the Southern Highlands, Jane. Each day there is a change with flowers and leaves popping up everywhere. The Manchurian pears have stopped flowering and are now busy ready to give shade when summer heat arrives. Oh it must be just beautiful in your area at the moment, Gerard. It’s wonderful to see your early spring garden, Jane. Everything looks gorgeous despite the difficult weather you’ve had leading into the change of seasons. I wish Ranunculus were as care-free here as they are for you as I love them too. As to where the aphids come from, I’d love to know that too! Thank you, Kris. I’m making sure I enjoy this part of the year as it’s quite likely to get hot and very dry before too long. We were fortunate to receive a reasonable amount of rain just at the right time which has made this Spring such a special time for gardeners. I wonder if ranunculas would do well in pots for you? Beautifully toned garden, Jane. I especially love that iris. Wow! I also hadn’t realise that Berberis flowers are so lovely. The thorns put me off when my mum planted a couple of juvenile plants in her garden on corners and because we had just had a first grandchild many years ago, she worried about thorns and eyes, and so dug them out. I’ve never paid them any attention since. But the combination of foliage and flowers is beautiful. Hope you’ve had decent rains. Cheers! Thank you for your comments, Prue. The Berberis thorns are quite awful really and I’m not looking forward to when I have to give the plants a good pruning. The ones I have are not like the ones used in hedges, being smaller and more manageable. We’ve had some quite good rain although we are still in drought. There’s no water in farm dams, so we need some heavy falls to remedy that. Beautiful ceanothus and what a display of ranunculus! Would you believe it was 21C here in the south east of England too yesterday although storms are forecast today. Similar temps! But ours are actually a bit chilly for this time of the year. How beautiful! Rain makes such a difference and it’s amazing how quickly plants respond to a good downpour. We’ve had good rain too. This morning we went to Bunnings and it was packed with people buying plants. That’s optimism for you! People are certainly feeling a bit more optimistic after the rain. It wasn’t nearly enough to break the drought-dams are still bone dry-but it did make gardens look a lot better. Fingers crossed that we receive some more! Beautiful photos. I don’t know why but I wasn’t aware of Ranunculas. Heading to a garden centre this morning for garlic but I’m going to look out for some of these as well now. Oh good. Ranunculas are so easy. I love your Ceonothus. Mine almost died last winter but after I cut it back hard it is coming back now. So nice to see all the beautiful spring blossoms. All leaves are falling off the trees and shrubs here and there is a nip in the air. But every season has it’s charms I think! My Ceonothus was very unhappy after flowering last year, but somehow pulled itself together and got going again. I believe they don’t like their roots to be too damp and I may have overwatered. I agree, there’s something nice about every season, although personally I have to look quite carefully to find Winters charms! I was wondering what you do with aphids. Do you just spray them? Hello Coral, I have been spraying the aphids with detergent in water and it seems to be working. I buy the plant-based phosphorus- free detergent. However, I think I made my last mix a little too strong and I caused a bit of damage- there’s always something to learn!